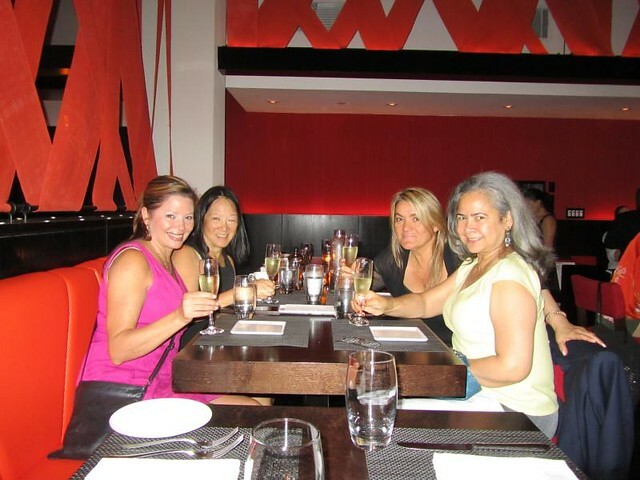 The warm weather this past week (along with the Book Expo America at the Javits Center) brought The Sofrito Girls together for some catching up. As usual, the Girls leave it to me to come up with restaurant reservations, and after some very strong suggestions from the ever tireless Carola (my assistant), and their win for Most Creative Paella at the 3rd Annual Paella Parade at Pier 17 last Monday, I made our dinner arrangements at Nuela in the Flat Iron district. The Sofritos are a pretty energetic, vocal group (ahem! ), but when it comes to ordering in a restaurant, they pretty much defer to me, so without much fanfare, I started the evening’s culinary adventure with a variety of appetizers. 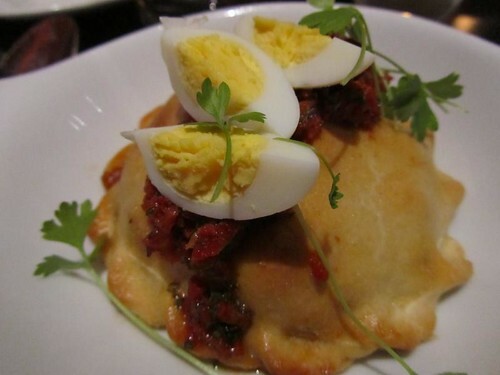 We started out with a delicious short rib empanada garnished with hardboiled eggs that was chunky, savory, and delicious with a slightly tangy-sweet finish. The crust was tender and flaky and the Sofritos agreed that this was a definite candidate for the Empanada Hall of Fame. Okay, we were off to a seriously good start, but could the rest of the evening still inspire the oohs and ahhs that our first appetizer elicited? We were about to ofind out! When I was invited by Winebow distributors to participate in a tour of the vineyards of Chile and Argentina, I asked my trusty assistant, Carolina, “Why me?” Now don’t get me wrong…I like a good glass of wine as well as the next guy or gal, but I don’t consider myself a wine expert or a wine writer of any capacity. I’m pretty much strictly a “stick to what you know” girl, and while I can write and discuss (and every once in awhile even cook!) a great meal, the extent of my comments concerning wine would be quite limited. In her infinite wisdom, Caro answered, “Well, this might be a great opportunity to learn more about the wines that would complement the food that you cook!” When she put it like that it made all the sense in the world, and so we accepted Winebow’s gracious invitation, and we set out to pack our bags. We arrived in Santiago, Chile at about 2PM Sunday October 3rd after quite the adventure! 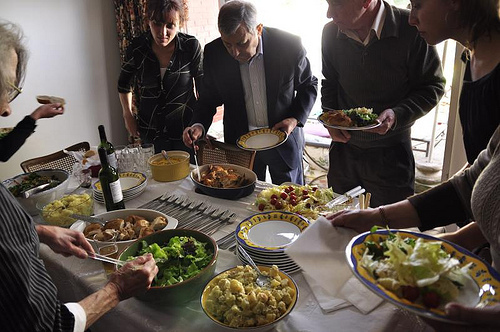 Santiago being Caro’s hometown, her mom and family had prepared for us a sumptuous family dinner with a houseful of aunts, uncles, cousins and friends…it felt like home! Carolina’s mom, La Vicky was there to greet us with a pitcher of chirimoya sangria, a mixed with white wine and the chirimoya fruit from Chile, that might well be the best I have ever tasted in my life!, Snacks of cheeses, dips and pates served with bread and crackers accompanied the delicious beverage that shared pride of place with delicious bottles of Chilean red wine and ice cold beer on the table. When dinner was served there were platters of delicious roast chicken, potato salad, yellow rice, green salads, and too many more sides to mention! Did I mention that the entire time I was there I could only think of Sundays at my abuela’s and mom’s houses. I couldn’t keep the grin off of my face! 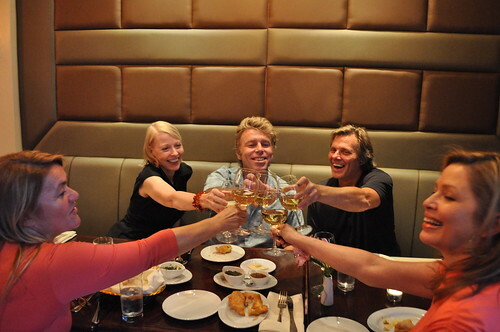 Sadly, the dinner wrapped up altogether way too soon, and we headed out to meet our group at Zanzibar Restaurant. 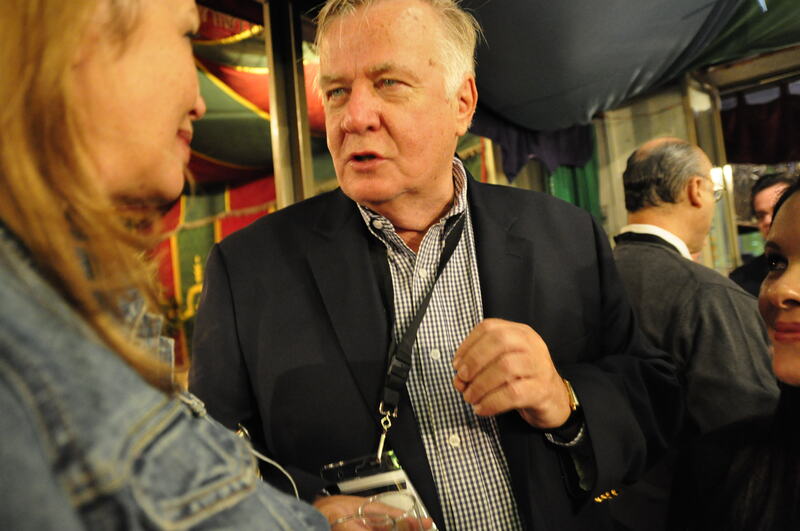 Upon arriving at the Zanzibar, we were met by the representative and head of Winebow, Alfredo Bartholomaus, a gracious, handsome Chilean gentleman who’s knowledge of oenology can fill volumes! The consummate host, Alfredo introduced Caro and I to our fellow adventurers, and I was please to see that I actually recognized Karen Page and Andrew Dornenburg, fellow New Yorkers, authors, and food writers. Alfredo instructed one and all to put their notebooks and pens away, as this was a night for fun, food, and getting to know you! 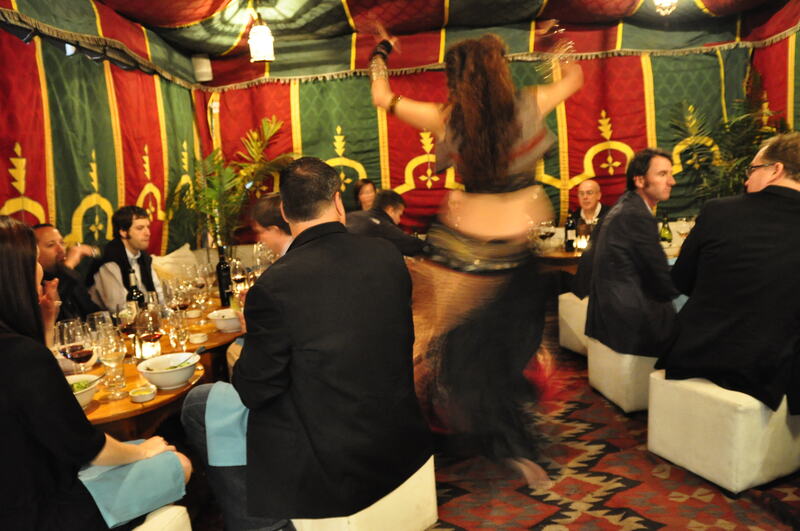 The evening wrapped up with an incredibly limber belly dancer! I got the feeling this trip was off to a running start and that’s without mentioning that our first stop the following morning was to the wonderful Leyda Vinyard in the town of Santo Domingo, about 80 kilometers southwest of Santiago! I made sure to go straight to bed after our delicious evening, so as to get a bright start to the adventure that awaited us on our next day! Many of you have heard me wax poetic about the Argentine chorizo from my buddy Alejandro Cantagallo who ran the family butcher shop, “Don Francisco’s Meats” in Jackson Heights, Queens (they make their own chorizo on site). Well, Alejandro has since closed the butcher shop, and has opened a new eating establishement, named for a beloved neighborhood in Buenos Aires called Floresta serving mouthwatering Argentine favorites. I usually start out a review with a picture of the restaurant entrance, and a view of the interior, but I can honestly say, I was so jazzed about the food that I forgot to document the “front of the house”. I had chosen Floresta to celebrate my friend Jimmy Johnson’s birthday, and it proved to be the perfect choice. Floresta has it’s liquor license pending, so Alejandro encourages BYOB, which I was happy to do. 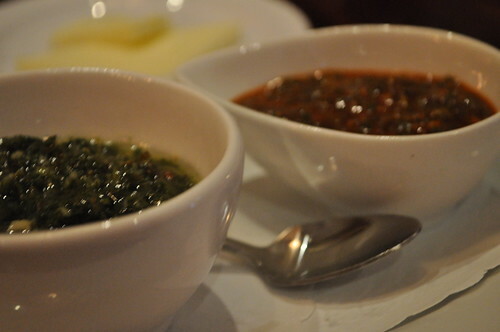 When you are seated in Floresta, you are welcomed with a basket of bread accompanied by 2 small bowls of Don Francisco’s famous chimichurri sauce, one sweet, and one hot. The stuff is absolutely addicting, and I can say that because I’ve actually taken the Don F tutorial at his butcher shop with His Lordship himself, Don Francisco! It’s not everyday that a girl has four fabulous boys prepare her an unbelievably delicious, multi-course dinner, but last night, I was the very lucky recipient of that exact phenomenon! Most of my friends say they feel intimidated to invite me over for dinner ( as if I’d ever turn down home cooking!! ), but last night my good buddy Jimmy rounded a few friends together, andalong with Rafael, Ritchie and Tim, prepared an enchanting meal which we shared amidst much fun and laughter. I was met at he door with a traditional Pisco Sour topped with a fluffy, creamy merengue drizzled with a splash of Angostura Bitters. 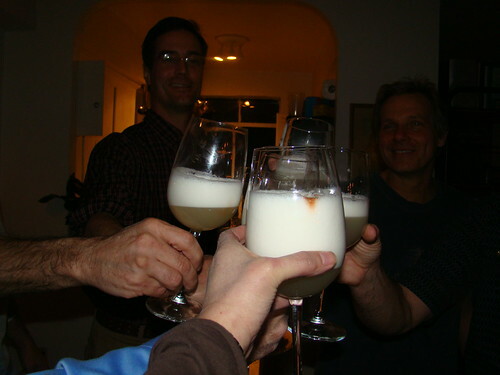 I’ve had Pisco Sours before, but this one differed in that the head of the cocktail was a true merengue prepared by our head Chef for the evening, Rafael. 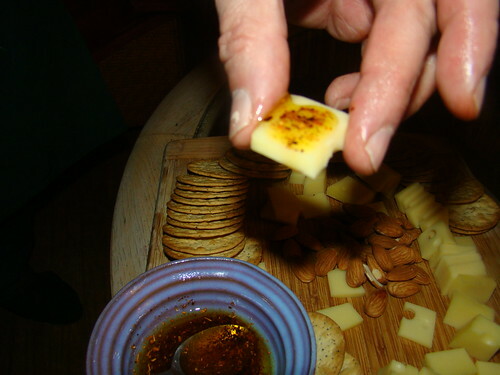 Tart and tangy, the drink was the perfect counterbalance to a quick and easy, but intensely flavorful dip Rafael put out with cheese, crackers and nuts to hold the hungry crowd over while he put the finishing touches on our dinner. The dip consisted of a seasoning called Mapuche seasoning, a pre-Columbian condiment made from salt, ground black pepper, ground coriander seed, and ground Cacho de Cabra chile, which is then smoked. The flavor is incredible, and when stirred into 1/4 cup of olive oil, makes a perfect casual dip for crackers, cheese or even grilled chicken or fish. In addition, it can be used as a dry rub for roasts, producing a flavorful crust which is superb! Last night was one of those rare evenings that Jerry and I share anymore, where all the kids are out with their own plans, and we are left to our own devices. With the impending scare of the Blizzard of 2010 (we’ve been thankfully spared with a mere dusting! 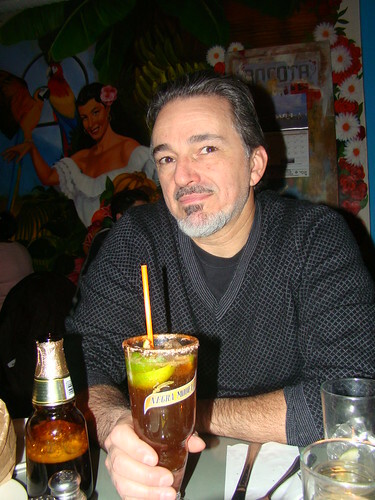 ), we decided not venture too far from home, and after much buzz, headed out to BOGOTA Latin Bistro in Park Slope, Brooklyn. The restaurant looks deceptively small when you walk in, but after being lead through a narrowish (and very well attended!) bar, we entered a beautifully laid out restaurant filled with families as well as couples out on a date. As soon as we were seated, we were presented by not one, but three menus: one Main menu, a Specials menu, and a Drinks menu. 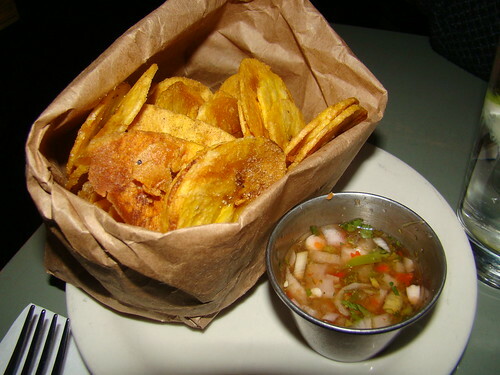 I put on my glasses to settle down to read, Jerry and I ordered a drink, and we were treated to complimentary plantain chips with a vinegary, spicy salsa for dipping. I’d say I was off to a good start! These salty, spicy little nibbles were the perfect balance to Jerry’s smoky, but refreshing Michelada! Jerry gets his Michelada on! Whew! Now that BBlog is back up and running (that took more than a little bit of elbow grease from Fredlet and Jason…thanks guys! ), we can get back to those gorgeous days spent on Whitehead Light Station with all my new friends. 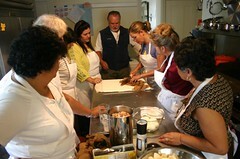 We started the day out bright and early, everyone up to speed on their notes for the days cooking! Our culinary flight would be taking the class to Argentina today! On the menu were Caramelized-Onion and Blue Cheese Empanadas, Humitas, Potato-Egg-Red Pepper Salad, Grilled Churrasco with Chimichurri, and a nod to Puerto Rico: Tierrita Dulce! 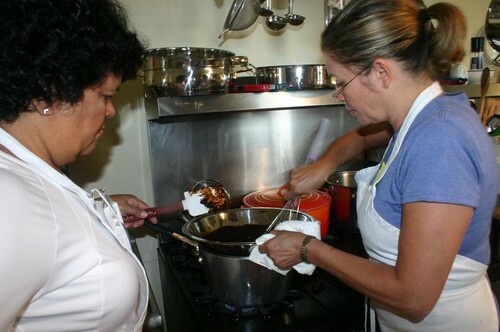 Daisy and Mercedes melt chocolate for the Tierrita Dulce. 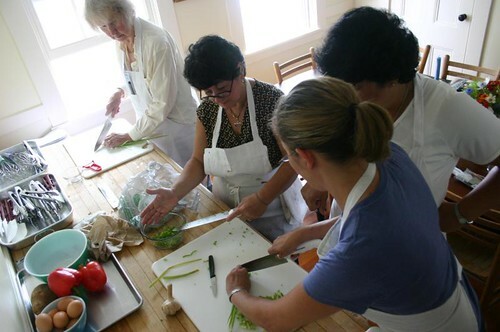 Eleen, Aida, Mercedes, and Daisy practising knife skills…rock the knife, Girls! 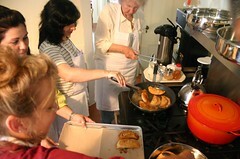 The class took their turn at roasting their own peppers, and learning how to crimp and pleat empanadas. We actually managed to learn a few things, despite all the hilarity going on in the kitchen! 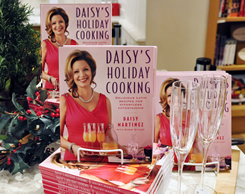 Cooking With Daisy… on Whitehead Island! 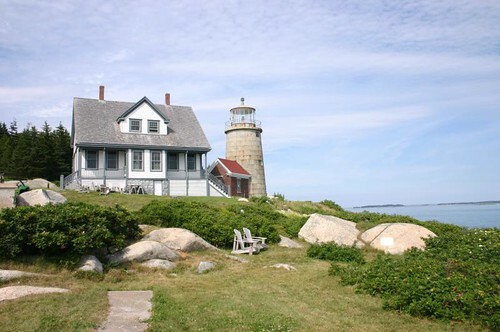 This past August 21-26, I had the pleasure of being invited to the Whitehead Light Station to cook with a group of students who had signed up to spend time cooking in the kitchen with me! Can you imagine? Well, I was geared up to have a great time, but nothing prepared me for the truckload of fun and laughs we had the days that we spent there. 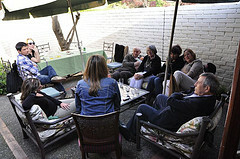 I will be covering the trip, day by day with pics and recipes in a few posts, so check back often for frequent updates. 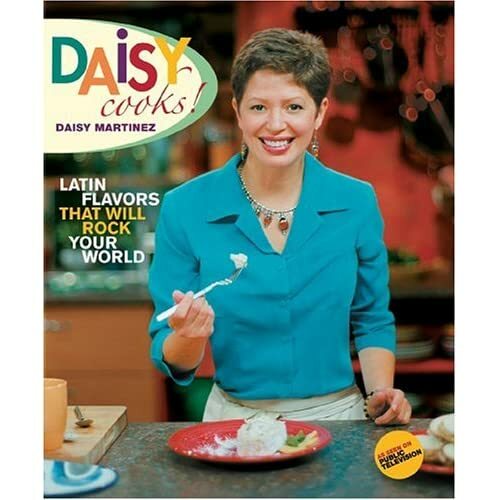 The recipes for today’s menu are featured as the monthly recipes at www.daisymartinez.com so stop by and take a look! the Guesthouse and Lighthouse on Whitehead Isand, a sight that took my breath away! After a quick perusal of the facilities, it was off the local Farmer’s Market in the nearby town of Rockland. Caro, Anne and I were taken back to the mainland by Captain Jon (or Tom, as I decided to rename him! ), and away we went. Anne cooks seasonally, locally (whenever possible), and organically, and was waxing poetic about the fare at the market. I couldn’t wait. Daisy and Ann Stires discuss menu options on the way to the Farmer’s Market in Rockland.